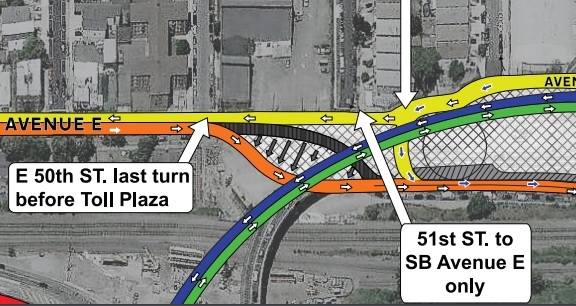 Northbound Avenue E was shifted into a new temporary alignment between 50th Street and 51st Street. Please CLICK HERE for more information and graphic. During the week of 06/06/17, crews will begin erecting structural steel within dedicated work zones during normal daytime hours. Work will be supported by Bayonne Police as needed. In mid-June 2017, nighttime roadwork will be performed in the Pulaski Street & Northbound Route 440 intersection. Lane closures and temporary detours are required to perform the work. Work will be supported by Bayonne Police. In early-June 2017, nighttime detours of the Pulaski Street Jughandle will be required for approximately one (1) week in support of bridge steel erection. Work will be supported by Bayonne Police. During the week of 06/12/17, nighttime detours of northbound Avenue E, 50th Street to 52nd Street, will be required for approximately one (1) week in support of bridge steel erection. Work will be supported by Bayonne Police. Northbound Route 440 reconstruction north of Pulaski Street continues. In early-July 2017, nighttime detours of the Pulaski Street Jughandle will be required for approximately one (1) week in support of bridge steel erection. Work will be supported by Bayonne Police. In mid-June 2017, nighttime detours of northbound Avenue E, 50th Street to 52nd Street, will be required for approximately one (1) week in support of bridge steel erection. Work will be supported by Bayonne Police. In late-June 2017, nighttime detours of the Pulaski Street Jughandle will be required for approximately one (1) week in support of bridge steel erection. Work will be supported by Bayonne Police. During the day on 05/10/17, northbound Avenue E will be shifted right to a new temporary alignment between 50th Street and 51st Street. This new alignment will be in place for several months. Please see graphic below. During the week of 05/08/17, nighttime single lane closures will be used on westbound Hudson County Extension, 9:00PM to 4:00AM, to install new signs and sign structures. During the week of 05/08/17, northbound Avenue E will be shifted right to a new temporary alignment between 50th Street and 51st Street. This new alignment will be in place for several months. During the weekends of 05/06/17 and 05/12/17, NJ Transit Light Rail Service between 34th Street Station in Bayonne and Danforth Avenue Station in Jersey City will be maintained via NJ Transit bus service, 3:00AM Saturday morning through 3:00AM Monday morning. During this period, bridge structural steel will be erected over the NJ Transit and Conrail train tracks. Please CLICK HERE for more information. During the weekend of 05/06/17, NJ Transit Light Rail Service between 34th Street Station in Bayonne and Danforth Avenue Station in Jersey City will be maintained via NJ Transit bus service, 3:00AM Saturday morning through 3:00AM Monday morning. During this period, bridge structural steel will be erected over the NJ Transit and Conrail train tracks. CLICK HERE for more information.